Valentine’s Day is that special day of the year when everything is about love, more than in any other day. One of the best ways to mark this celebration of love is by taking your sweetheart on a holiday and create new memories that can make you both smile even after many years. Although cities such as Paris or Venice are usually the main romantic destinations for Valentine’s Day vacations, Romania also has places that can turn out to be the perfect choices. 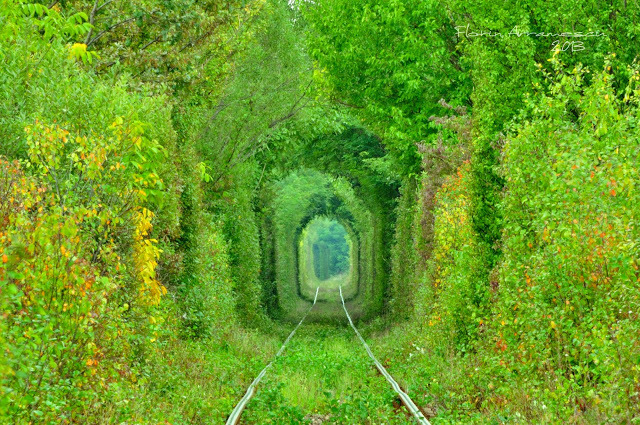 This old, abandoned railway track segment in Romania, nicknamed the Tunnel of Love, should definitely make it on the “Valentine’s Day vacation” list as it’s a perfect place for romantic photos. The track is located between the cities of Otelu Rosu and Caransebes in Romania, at about 470 km from Bucharest. The easiest way to get there is by car, the place also being marked on Google Maps. Back in 2014, the Romanian Tunnel of Love was included among the European Union’s hidden treasures. More photos of the Love Tunnel can be found here. Although it sounds a bit too cold for such a “warm” celebration, the Hotel of Ice in Romania’s Fagaras Mountains is a place to try for a romantic getaway. 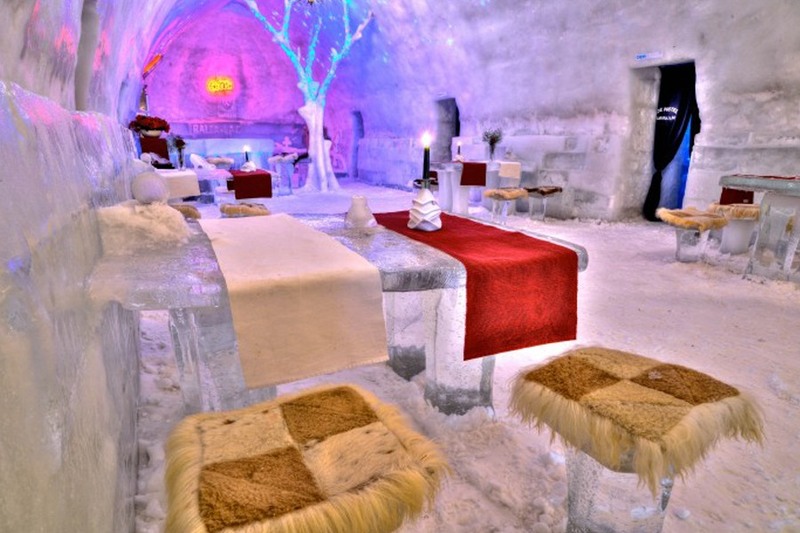 The hotel, which is located near Balea Lake, is built every year from blocks of ice and snow. It has a different theme every year, the music being this year’s main theme. It has 14 rooms and 6 igloos. A double room at the hotel costs EUR 100 per night, while the accommodation in an igloo, where six people can sleep, costs EUR 150 per night. Find more information here. Another unique and romantic experience in Romania is offered by the old steam trains known locally as mocanita. 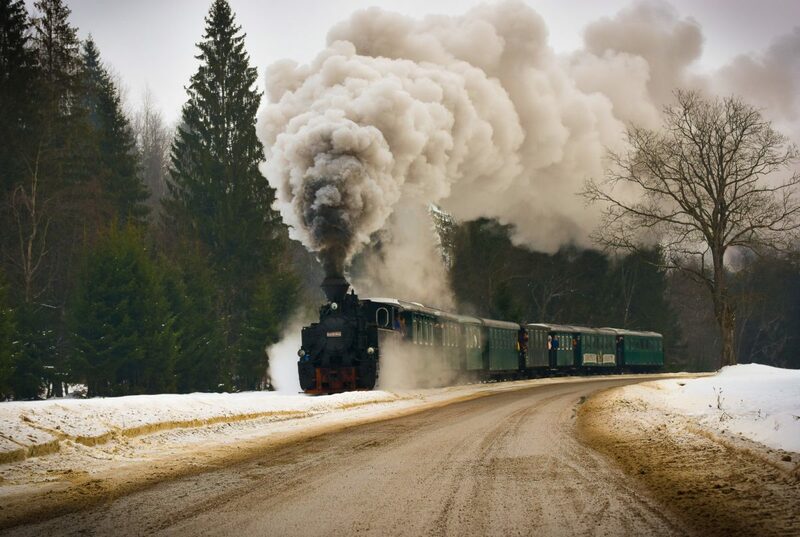 These trains can usually be found in mountain areas of the Maramures, Transylvania and Bucovina regions. Their locomotives are steam-powered, offering a trip into the past to their passengers. Among the steam trains to try, there are the ones in Viseul de Sus (Maramures), Teaca-Raciu (Bistrita), Sovata-Campu Cetatii (Mures), and Sibiu-Agnita (Sibiu). Find a more detailed list here. This is one of the most unusual waterfalls in the world and one of the most beautiful in Romania. The water runs over a dome-shaped rock, thickly covered in moss, which splits the flow into a fine filament-like cascade. Located in Caraș-Severin county, the nearest cities are Reșita to the north and Timișoara to the north-west. Last spring, a tourist path was set up in the area, making it easier for the tourists to reach it. 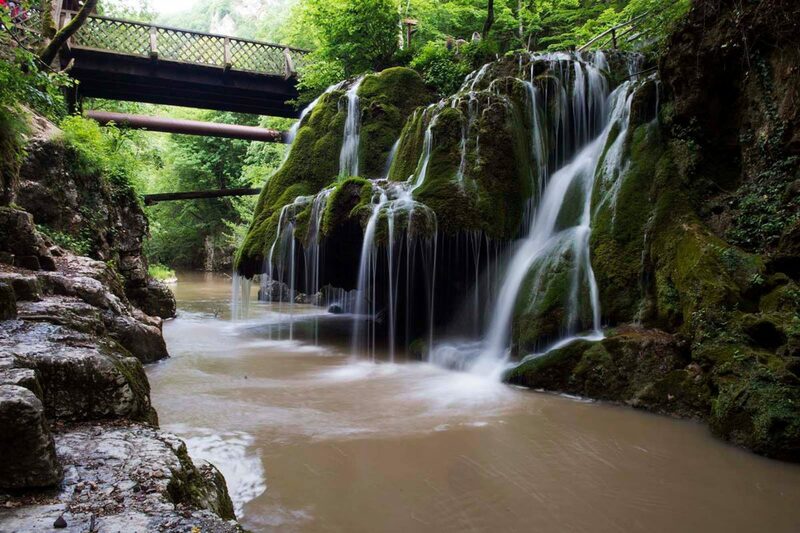 This special place in Romania is also marked on Google Maps as Bigar Cascade Falls. In 2013, the Bigar Waterfall was included on a list of unique waterfalls from around the world, published by The World Geography.com. This city in southwestern Romania is home to an ensemble of sculptures by famous Romanian artist Constantin Brancusi, which also includes the well-known Kiss Gate (Poarta Sarutului). 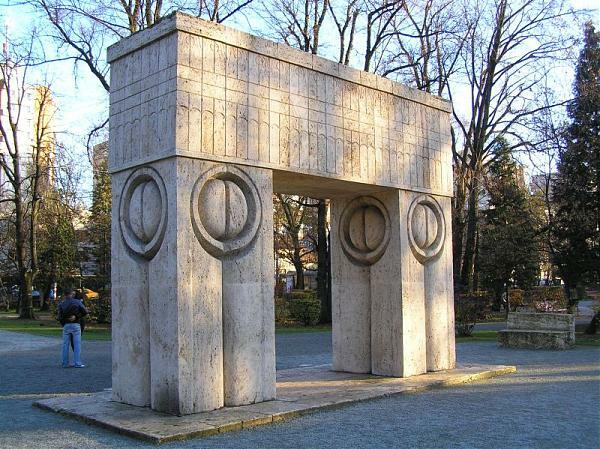 Although the sculptural ensemble created by Constantin Brancusi at Targu Jiu is an homage to the Romanian heroes of the First World War, consisting of three famous sculptures - the Table of Silence, the Kiss Gate and the Endless Column, the Kiss Gate has become more of a symbol of love, with newlyweds going there for special wedding photos. Tourists also stop at the sculpture to take photos while kissing. Targu Jiu is located at some 300 km from Bucharest and can be reached both by train and by car. With its beautiful architecture and paved streets, this city in Transylvania is definitely one of the most romantic cities in Romania. Visits to the Brukenthal Museum and the nearby Astra Museum, followed by a long walk in the evening and photos on the Liars’ Bridge may be perfect for a romantic day. 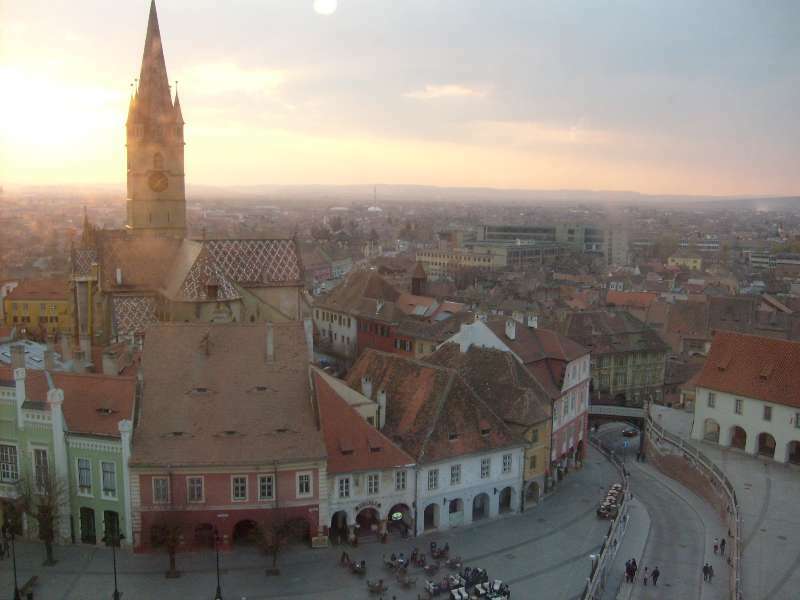 Sibiu was the capital of culture in 2007, together with Luxemburg, being the first city in South-Eastern Europe to receive this title. It’s located at about 300 from Bucharest and can be reached by car, train, or by plane. The airport is not far from the city center. 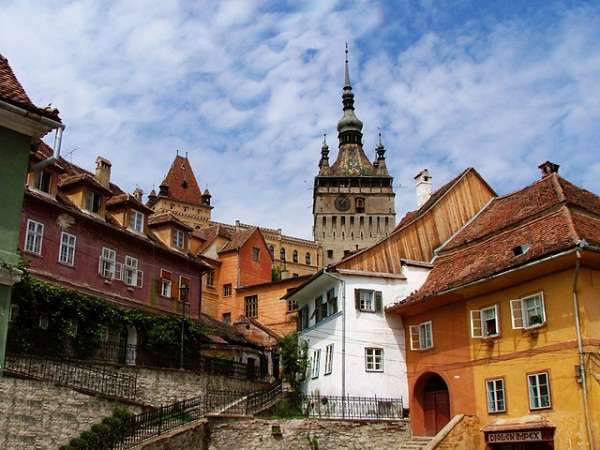 The Transylvanian town of Sighisoara, which is known as the birthplace of Vlad Tepes (Vlad the Impaler) – the real-life inspiration for Bram Stoker’s Dracula, is much more romantic than its description may make you believe. It is one of the most beautiful and well-preserved inhabited citadels in Europe, with authentic medieval architecture, which makes the city perfect for romantic walks and pictures. 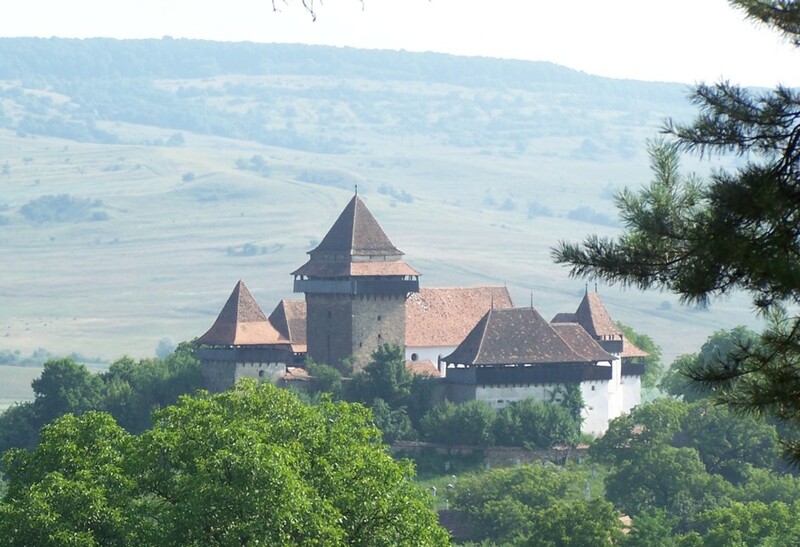 It can be reached by car and by train, with the closest airport being the one in Sibiu. This well-known mountain resort in Romania has a lot to offer to romantic couples, from beautiful landscapes to restaurants and many touristic objectives. A perfect spot for photos is the Sforii Street (Strada Sforii) in downtown Brasov, which is said to be the narrowest street in Europe. The famous Bran Castle, also known as Dracula’s Castle, is also in the area, while ski fans can try the ski slopes in Poiana Brasov. This beautiful village in Transylvania, which is a favorite of Prince Charles of Wales, has a lot to offer and may be perfect for a short romantic vacation away from the big city noise. It is best known for its fortified church, but visitors can experience local traditions and food while enjoying long walks on its streets. Viscri is one of the seven Transylvanian villages included on the UNESCO World Heritage list. Thus, those who plan a longer vacation can also visit the other villages, namely Prejmer, Biertan, Valea Viilor, Calnic, Saschiz, and Darjiu. Last year, Businessinsider.com included Viscri on a list of “25 secret European villages everyone should visit in their lifetime”. Valea Prahovei may be the easiest and most convenient choice for those living in Bucharest, but other romantic couples should consider this destination too as it has a lot to offer. 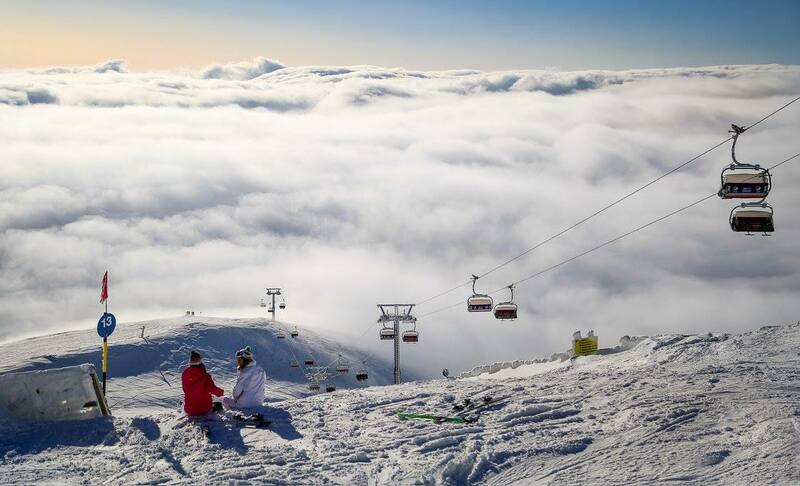 The area includes some of the most popular mountain resorts in Romania, such as Sinaia, Busteni, Azuga, and Predeal. It hosts two of the most beautiful castles in the country, namely the Peles Castle in Sinaia and Cantacuzino Castle in Busteni, as well as ski slopes for winter sports fans. Lovers can spend a day on top of the mountain (for example, Cota 2000 in Sinaia offers amazing views), followed by a romantic dinner in the city and a long evening walk through the cities’ streets. All cities on Valea Prahovei can be reached by car, but plan your vacation well as the road connecting Bucharest to Valea Prahovei usually gets extremely crowded during holidays or weekends and you can end up spending most of your vacation on the road. Taking the train may be a better choice. Other destinations to take into account: Cluj-Napoca, Maramures and Moldova regions – with their beautiful churches and traditions, Timisoara, and Hunedoara – with its beautiful Corvinilor Castle. Even the seaside can be a romantic destination in winter.